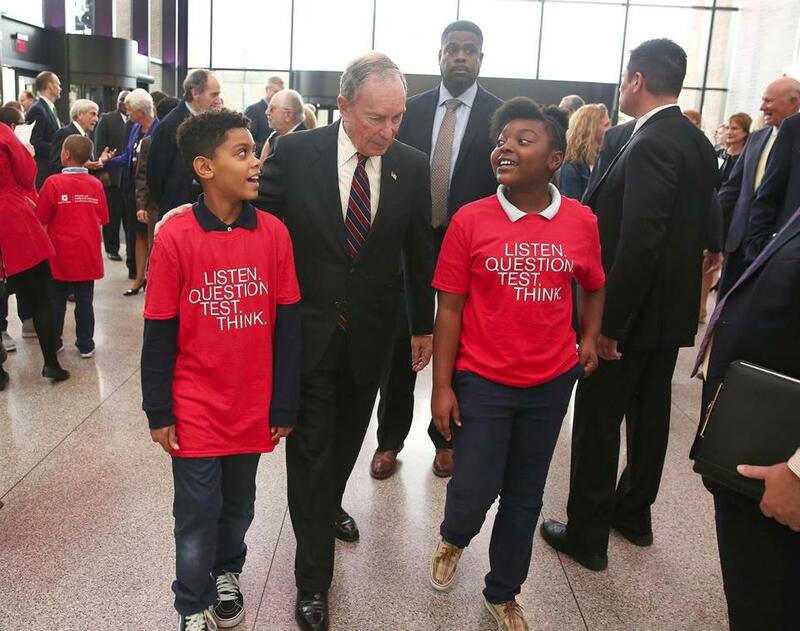 Michael R. Bloomberg (center) walked through the Museum of Science on Tuesday. Everyone around here knows Michael Bloomberg as the kid from Medford who went on to do big things. He built a multibillion-dollar company and served as a three-term mayor of New York. But what people might not know is that Bloomberg credits the Museum of Science for helping to shape who he became. “I went every Saturday, and it changed my life,” recalled Bloomberg, 74, who attended classes there starting when he was about 10 and through his high school years. On Tuesday, Bloomberg will be back in Boston to reveal that his foundation, Bloomberg Philanthropies, is donating $50 million to the museum, the largest gift in the institution’s 186-year history, one that will ensure that generations to come will benefit from the kind of programs Bloomberg grew up with. 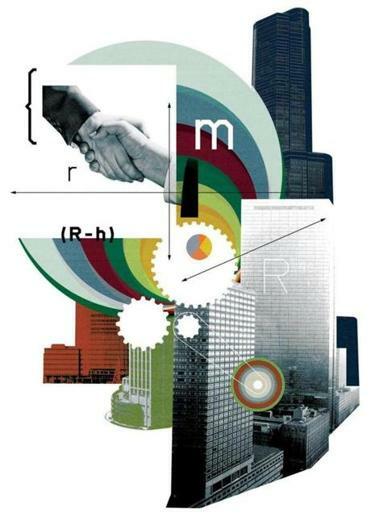 A new program from Bloomberg Philanthropies and Harvard University will help mayors do one of the most complex jobs on the planet. The gift, which will increase the museum’s existing endowment by nearly 40 percent, will go particularly far because it’s not about building a new wing but rather supporting educational initiatives, such as programs and exhibits that promote science and engineering. Bloomberg also wants to send a message: the United States needs to invest in science education. The museum’s education division will be called the William and Charlotte Bloomberg Science Education Center, in honor of Michael Bloomberg’s parents. At a news conference, Bloomberg will unveil the new signage outside the museum’s main entrance. For Museum of Science president Ioannis Miaoulis, the gift is a reminder of how the museum is as much an educational institution as anything else. The museum is one of the biggest producers of engineering curriculum for elementary students, reaching 10.5 million children and 122,400 educators over the past decade alone. Miaoulis also hopes that Bloomberg will inspire others to give more to museums of science everywhere. Boston Mayor Martin J. Walsh, who will attend Tuesday’s ceremony, called Bloomberg’s gift an innovative approach to promoting so-called STEM education: in science, technology, engineering, and mathematics. “It’s the future of our economy,” he said. Bloomberg (left) gave in the name of parents Charlotte and William (with sister Marjorie). Bloomberg began rekindling his relationship with the Museum of Science over the past decade. When he was still mayor of New York, Bloomberg invited Miaoulis to a small group dinner in Boston to discuss philanthropy. Bloomberg — with an engineering degree from Johns Hopkins University and an MBA from Harvard Business School — made his fortune by launching a financial information company built around selling data terminals to Wall Street. One of the richest people in the world, with an estimated net worth of over $40 billion, he has pledged to give all of his money away before he dies. Or, as Bloomberg has been known to say, he hopes to “bounce the check to the undertaker.” He has already donated about $4.3 billion. While Bloomberg put down roots in New York, he has not forgotten his hometown, sprinkling donations around the region, from the Mother’s Walk on the Rose Fitzgerald Kennedy Greenway to a recent $32 million gift to Harvard to form a municipal leadership initiative. He also forged a relationship with the late Boston mayor Tom Menino to form Mayors Against Illegal Guns. Until that dinner to discuss philanthropy, Miaoulis had never met Bloomberg, and he was surprised that the entrepreneur-turned-politician had such vivid memories of the museum. Growing up, Bloomberg would often catch a bus from Medford by himself, head into Sullivan Square in Charlestown, and then take the T to the museum. After the dinner, Bloomberg stepped up his donations, giving in the tens of thousands of dollars range to support the renovation of the museum’s Charles Hayden Planetarium and to fund programs such as student field trips and internships. He also appeared in a video for the museum’s capital campaign. In 2011, Bloomberg came up to Boston for an event to celebrate the upgraded planetarium, but arrived a few hours early to explore the museum. Miaoulis was eager to give him a tour to show how the museum had changed since Bloomberg was a kid. John Afendoulis of Newport, R.I., viewed the sequoia cross-section with son Auxentios, 4. The exhibit was a favorite of Bloomberg when he was growing up in Medford. 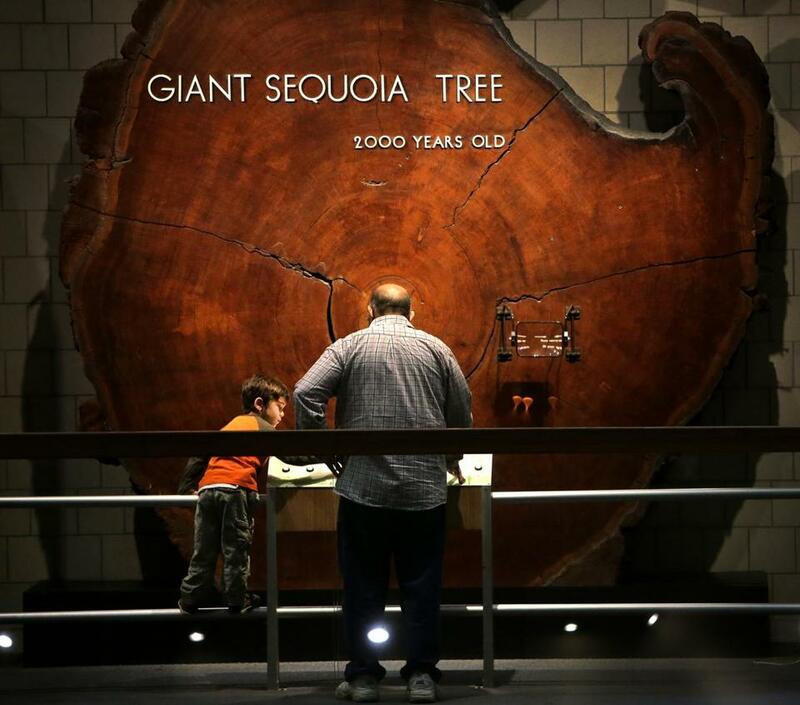 The sequoia exhibit — a crosscut of a 2,000-year-old tree — had made a deep impression on a younger Bloomberg, who wrote about it in his 2001 autobiography. He learned about critical thinking when an instructor at the museum asked his class about the “redwood tree.” But students thought they got the right answer, not realizing that the question was a misdirection that tested their attention to detail. The tree was actually a sequoia. Bloomberg, in an interview with the Globe, said the museum has changed quite a bit, but what he loves about it hasn’t. The museum was also a special place for Bloomberg’s mother, Charlotte, who celebrated her 100th birthday there in 2009. She lived in Medford in the same house Bloomberg grew up in until her passing at the age of 102 in 2011. 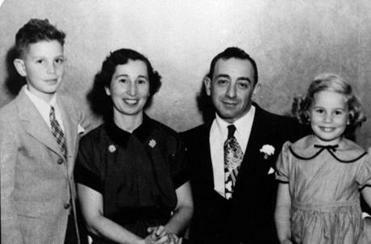 Bloomberg’s late father, William, was an accountant at a dairy; his mother was an office manager. After leaving New York City Hall in 2013, Bloomberg returned to the company he founded, Bloomberg LP, and has been ramping up his philanthropy. This year, he weighed whether to enter the presidential race as an independent, but decided not to. The donation also reflects Bloomberg’s belief the country isn’t spending enough money on basic science research.